While the ceramic pig has a nice touch of nostalgic charm I think this modern take on the piggy bank lends a bit more peace of mind in terms of keeping your money safe. The ATM Bank accepts real coins and paper money VIA an authentic electronic bill feeder. (Operates with U.S. currency only.) 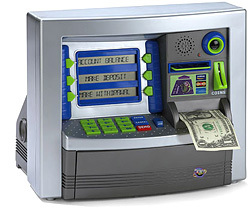 It dispenses cash like a real ATM does and continually tracks deposits and withdrawls keeping a running total of your savings. You can even limit who can access your cash with a secret PIN number. However since your ability to make transactions is pretty much dependent on the unit’s 3 AA batteries you might want to think about keeping a fresh set always on hand. The ATM Bank is available from the Discovery Channel Store for $39.95. I’m not a grahmmer nazi in general, but the whole “ATM Machine Inside” signs that you see on liquor stores really bugs me. I have seen this before, I am going to get one of these for my kids (when I have kids!) to teach them about banking, saving money, and to give them a kick start to financial responsibility. Schweet.